The State Department formally lifted its hiring freeze on Tuesday, ending a moratorium that has been in place for 16 months. Secretary Mike Pompeo announced the end of the freeze in a message to employees just weeks after his swearing in, fulfilling a promise he made during his confirmation hearing. The decision will allow the department to bring on both foreign service and civil service employees up to “current funding levels,” a State official said. The official added the secretary’s decision would give both domestic bureaus and overseas missions “the flexibility to fulfill positions that are essential” to meeting the department's goals. Former Secretary Rex Tillerson said in April 2017—just after Office of Management and Budget Director Mick Mulvaney lifted the hiring freeze President Trump had implemented on a governmentwide basis days after taking office—he was using his unilateral authority to continue the moratorium at State because he was conducting a reorganization of the department. The freeze, he said, would continue until his reforms had been fully implemented. Tillerson’s planned “redesign” was later pared back significantly and even those smaller changes were placed in limbo after his ouster. State had carved out numerous exemptions to the freeze across its job series, allowing the department to hire thousands of new employees despite the pause. The exemptions had become so complicated the administration officials who briefed Pompeo during the preparations for his confirmation hearing were not even sure if the freeze was still in place. 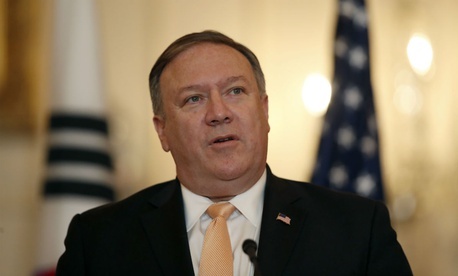 “I want the best of America, in a way that had traditionally been part of the State Department, to say ‘I want to be a professional officer at the State Department,’” Pompeo said. He explained that he spent a lot of time working on improving human capital management and recruiting at the CIA, noting the agency did not devote the proper resources to those efforts, and promised to undertake a similar endeavor at State. Vacancies at State piled up during Tillerson’s hiring freeze. In the first eight months since Trump took office, State’s workforce declined by 6 percent. Employees on the foreign affairs rolls dropped by 12 percent. Pompeo promised to fill vacancies across the department, which he conceded were hurting morale. He also promised to ask the president when State needed more resources, noting Trump always granted his requests when he did so at CIA. State actually suffered a cut of $1.8 billion for its operations and those of related agencies, though the reductions stemmed largely from cuts to the United Nations and the elimination of one-time counterterorism funding.